Jacqueline Gens: I think we would like to start with your life as a monk. How old you were when you became a monk? Tashi Mannox: I had just turned 22, quite young. Akong Rinpoche suggested it. I had wanted to become a monk since one of my first encounters with Tibetan Lamas on a family holiday in the Mid-South of France at one of the first Buddhist centers in Europe. I met these old wizened lamas and they were really great with us as kids. I was around 11 years old or something like that and I was really inspired by them. They were really kind and very wise and quite simply I thought, “Well I want to grow up and be like that.” I looked at my own parents and other adults and they just seemed to be quite neurotic compared to the monks. The monks were happy. So that was my motivation. A happy life. I loved the way they looked. Whenever I would see them I would kind of pull at their top robe and wrap it around myself. But it wasn’t until I finished my education in the arts, I studied a Master of Arts – I had never told anyone I wanted to be a monk – it was something that I did not dare say because I was frightened of rejection, I was frightened that perhaps they would say, “No, you’re not good enough to be a monk.” I had this idea that you had to be a special sort of person to become a monk, which of course I have learned since is nonsense. But then there was an occasion in 1981 where His Holiness the Dalai Lama was visiting the UK and he went to the Samye Ling Buddhist centre in Scotland. I was just finishing my studies and I had sewn myself a more traditional Tibetan style chuba, and I thought if I was going to meet the Dalai Lama I had better look respectful. 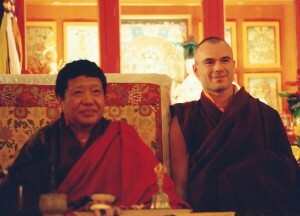 I made this chuba in a dark brown maroon color, and Akong Rinpoche, who was already very much connected to our family, saw me and sent a message back to Lama Thupten and Lama Ladro, who were living in my home town of Birmingham [UK], that Rinpoche had foreseen that I would become a monk in the very near future. So he kind of saw it and within a few months I took the monk precepts from Kalu Rinpoche. When Lama Thupten had told me Rinpoche’s wishes I burst into tears and I thought how did they know that I wanted to become a monk? In another way it was a kind of sense of relief as well because I was just leaving university and starting my adult life and of course there is a lot of expectation as a young person to find a career and all that sort of thing. And for me becoming a monk was the best career option there could ever be. So to have that given to me was wonderful. 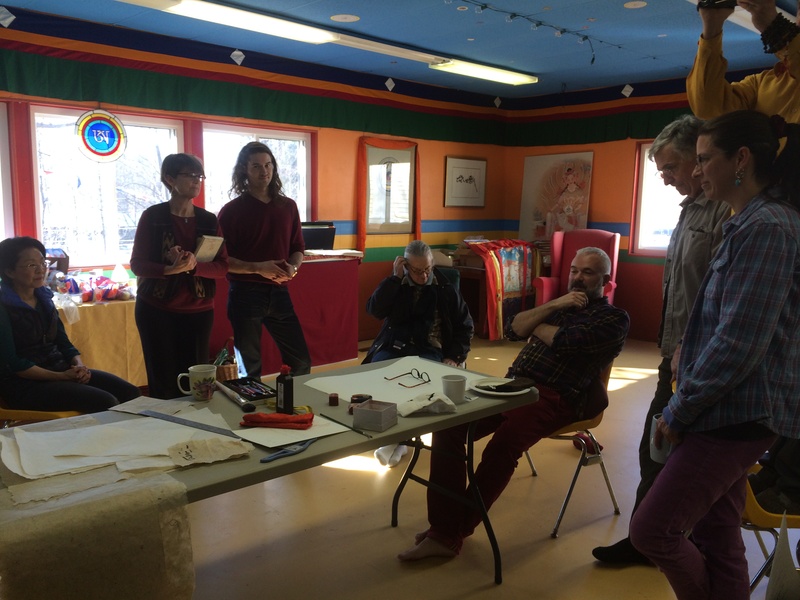 JG: Had you had any exposure to Tibetan artistic practices before? TM: Some yes. As my parents were both were both Buddhists and artists, they would have been looking at Tibetan art and thankas, and as a kid I visited Samye Ling which is decorated very richly, so it was all around me. There was also a master of Tibetan art living at Samye Ling, Sherab Palden Beru, as a child I used to sit in his thangka painting room and watch him work, observing the Deities in the thangkas, his delicate choice of colours and the beautiful stylized landscape of the Karma Gadri tradition he held. JG: You were an artist in the Western tradition in terms of your schooling? TM: Yes, I had a normal Western art training and schooling. I will say that during my conventional schooling I have had a lot of magic in my life because this was the time when His Holiness the 16th Karmapa came on his famous tour around Europe and America, we followed him as a family. I can say that in my childhood experience I have had a lot of magical times meeting Karmapa and his Lamas and a lot of spirituality that have a very deep and long lasting impression on me. And because I was naturally artistic anyway, it seemed natural to pursue the arts within that tradition. JG: You remained a monk from the age of 22 until you were 38. Was Akong Rinpoche disappointed when you disrobed? TM: Yes he was. I was a major cog in the machine of Samye Ling, so as much as anything, he was sad that I left because I was so close by his side and useful I guess. JG: Was Akong Rinpoche a monk his whole life? TM: Akong Rinpoche was not a monk his whole life. He gave his robes back very early on, he married when he came to live in the West. JG: Do you mind if I ask what precipitated your leaving? TM: There were many reasons. For me personally, although I loved being a monk, there were aspects of it I kind of fought against, like being institutionalized in that way. Samye Ling was a changing place, becoming more of an organized institution to keep up with the tightening of Western society. I was also kind of curious to see how I would get on in the “real world”. You know, because I had been a monk all my adult life and it was a natural process learning once again to stand on my own two feet, that was what Akong Rinpoche very much encouraged, I had to learn to stand on my feet as a monk, you know becoming a monk is quite a shock although, it is quite a change… and I needed to learn how to stand on my own two feet as a lay person too. JG: Was it hard when you disrobed? TM: It was very hard. I cried my eyes out. It was a horrible thing and I didn’t like it all. You are suddenly stripped of everything. One has a very strong identity as a monk, and perhaps that is not always a good thing, the bad side is that you are put on a pedestal, people call you Lama and things and people have great expectations of you. You do represent the Buddha, Dharma and Sangha, there is the symbolic side as well, but you are cushioned, it is meant to be that way so that you have the time and less distraction to get on with Dharma practice. Going out in the real world for the first time I had to learn all the ways of life, earning money, paying rent, domestic bills and paying taxes and all sorts of things and I had to learn very quickly. And that was a bit of a struggle at first. I went to live in London. I threw myself in the deep end. I said, “Well if I am going to be an artist I should live in London”, where there would be all the connections and if you manage to be successful in London, the rest of the world is a piece of cake. Even though I was a little fearful, I still had a kind of inner confidence that the monk thing gave me. I just was “getting on with it”. I did maintain some contact with the sangha but I needed to pull away in the beginning to establish myself. Akong Rinpoche would ring me up once a week for the first year. I lived my first few years in London as the poor artist, really the poor artist, living illegally in a studio I rented very cheaply. There was no shower, it had a big old sink in the corner that I used to fill up pans of boiled water and I used to bath in that. I experienced that side of things. For years and years in my wallet I had a couple two American dollar bills. I had kept them there for good luck. One day I was so poor and so hungry, I had to go and cash in my 2 two dollar bills! And it broke my heart, but I had a really good meal that day. JG: As a monk, were you doing a Ngondro practice? TM: Yes and I started with a yidam practice of Manjushri, so I could have a better ability for the learning, there is a lot of learning to do, learning the Tibetan language of course, learning to speed read in Tibetan during the sadanas. I put all my energy into it and I was very interested in all the different aspects of being a Tibetan Buddhist monk, such as the ritual etc., I learned all the musical instruments and the elaborate rituals belonging to the Tantras such as Cham Lama Dance, etc. By the end I was pretty fully trained in all those different aspects. I became the chant master and was instructing in all these disciplines. This was in the Kagyu lineage tradition. I did the Ngondro twice over. And then in my mid twenties I went into the traditional three year and three month retreat. Yes lots of training and lots of great opportunities, as in those days in the 80’s and into the 90’s there was a great flow of scholarly and learned Tibetan lamas and realized Rinpoches coming to the West, again and again and again. And because I was one of the few Western monks around at that time, I kind of got them all to myself, I was this cute young thing so they would come and pinch my cheek and gave me a lot of attention; I was lucky really. I was in the right place at the right time. It was nice. JG: That was a kind of training in itself because you give people a lot of attention as a teacher. I think that is a very strong point of yours. TM: Yes well I have always been kind of a humanist. I like to engage people, I can’t help myself being a peoples person, and I think that is because of how they were with me I suppose. I’d rather be real and personable. JG: Tashi, can you tell us how you started to teach? TM: As a monk I was always instructing and teaching anyway. The latter seven years I was a monk I was sent around to all the different dharma centers around Europe and also to Russia as well. I would lead retreats, for beginners and advanced meditation as well as in the various sadhana practices, so I had a lot of experience teaching in a more formal way as a monk. I have to say, quite often I would be sitting there as a monk and I would be teaching and giving advice to people who were not monks and nuns, who came from a lay life, from their city life and so on, and you know in the back of my mind I used to think, “I feel a bit of a fraud here”. I am giving these people advice, but I don’t really understand what they are experiencing and the difficulties of their everyday lives, their relationships, etc. And that is another reason why I sort of booted myself out into the “real” world and to put into practice all that I had been practicing on my nice fluffy, meditation cushion. TM: Well Akong Rinpoche was a very important force for my whole family, as I said he was the family Lama, he was the second Akong Tulku. He was an abbot for a small monastery in eastern Tibet called Dolma Lhakang famous for Green Tara. He was a boyhood friend and had a similar tulku education as Trungpa Rinpoche. Trungpa’s monastery was not so close to Akong’s monastery, it was a couple of days horse ride, but in Tibet that is not far. Both Trungpa and Akong were holders of both lineages of Nyingmapa and Kagyupa. Akong and Trungpa escaped from Tibet together and took with them many of the monks and nuns and also the families affiliated with them, who often really ran the monasteries. Only a few of the large party managed to escape Tibet. 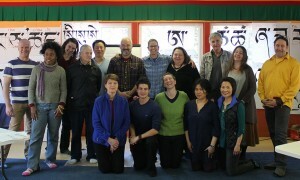 During their arduous journey the smaller party nearly starved to death, eating only saddle leather, it was at this point that Akong Rinpoche vowed to help the homeless and hungry, later this experience became his initial drive to set up an international charity called Rokpa to feed the homeless and give education, especially in remote areas of Tibet. For me Akong Rinpoche was like my spiritual father, as he cared for me from a young age. He was my main guide though my monk years advising my Dharma practice. He encouraged me in practical skills too, like teaching me to sew the traditional ceremonial robes and hats of a fully trained monk and of course in the art of Tibetan calligraphy. He imposed a very high quality to anything I did, there was no second best and set a high standard in me to this day. Rinpoche was a man of few words, so anything he did say was taken with full meaning and had a deep effect. JG: In the film Crazy Wisdom about Trungpa Rinpoche where Akong Rinpoche is often talking about the escape was just heartbreaking, so few of them survived. TM: Akong Rinpoche’s younger brother, Lama Yeshe Losal Rinpoche, was also very close with Trungpa Rinpoche and was able to tell many dramatic stories about their journey out of Tibet together, etc. He was my Abbot at Samye Ling. Now he is responsible for Samye Ling since Akong Rinpoche tragically passed away. JG: Can you talk a little bit about how and why you first started copying Tibetan texts? TM: Yes being a scribe is great training. 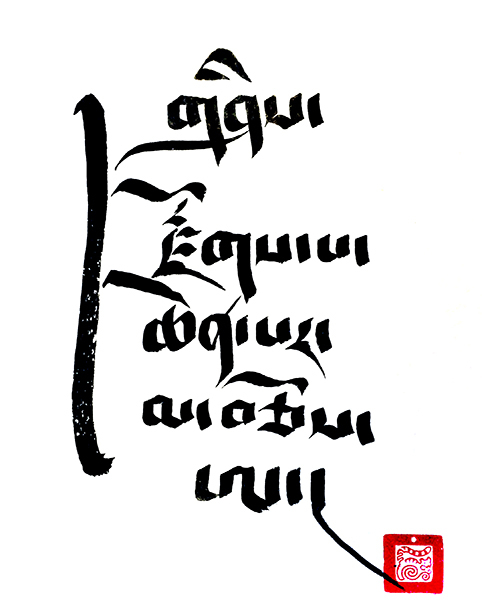 I always had this artistic propensity, so I saw the Tibetan language as an art form. I noticed from a very young age the beauty of the Tibetan writing. And of course I wanted to do that. I wanted to master that discipline. JG: More than thanka painting or other Tibetan visual arts, for example? TM: More than thanka painting for some strange reason. I think it was because it had something to do with me being dyslexic; I was dyslexic in English so I had more determination. I couldn’t do so well with English so I thought, let’s give Tibetan a try and see if I can do that better. It really drove me. 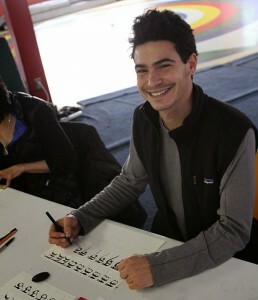 Because as a Buddhist monk you are reading all the prayers and sadhanas and everything in Tibetan, so I was looking at them every day and sometimes we were given the manuscripts or the pechas which were very poorly printed and the paper and letters were wearing out, so I would start to copy these. I would have to write quite neatly so it would be more legible. Then the Lamas noticed this and they said well if you are going to do this, let’s do it properly. Here is a big manuscript, you copy this; it’s an old ancient manuscript that is falling apart and you can have the job of copying this as a way to preserve it. And so that is how it of started. JG: Do you remember what the text was? TM: The first one I was given was a manuscript on Mahakala; there is a yearly Mahakala, a monthly Mahakala, and a daily Mahakala. They are different texts. I was given the monthly Mahakala to write out and there are some other smaller prayers that go with that as well. That took me a whole year to complete and reproduced, it is still used today. It was a great discipline. That is before there were computer-generated fonts. JG: Have you thought of creating your own special font? TM: Yes, I was invited to do it a couple of years ago, Mr. Font of Apple/Mac got in touch with me and invited me to design Tibetan fonts for Apple. It was a bit of a compliment, but when I looked into it, there is a big but, when you have to compose one font is not just the alphabet, but everything has to fit together in a very technical way, all the punctuation marks and everything. They say it takes about 2000 hours of work. That is a lot of time and time for not much else. I had to make a decision and because I am not willing to become a complete tech head working on computers, I declined, though I would be happy to work with someone to do that. JG: In this time as a scribe, did you create your own technique of how to write the letters? TM: A little yes. I used tools that were not normally used in Tibet. This can affect the writing style. For example, I had to use a mapping pen because the writing is very small for the manuscripts, and traditionally they would use a bamboo pen, which was quite pragmatic and not very reliable, so using more a mapping pen, the technique had to be changed a little, so as long as the end result looked authentic it didn’t matter. It wasn’t until years after, after many, many years of working as a scribe, that I started to work bigger, and started to work on major calligraphy as art pieces. I was very much inspired by the work of Trungpa Rinpoche, of course, and Situ Rinpoche. Situ Rinpoche visited Samye Ling on a regular basis and would come every summer, I was really fortunate to sit by his side while he created his own artwork and calligraphy. I learned a lot and he would advise and show me. 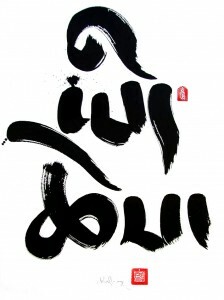 JG: What were some of the qualities Situ Rinpoche brought to his calligraphy? TM: What I love about Trungpa’s artwork is not just his aesthetic but his approach – his meditative approach – to dharma art and calligraphy as a meditation and the importance of the mind of now-ness. I really love all of that. It is something I am interested to develop further within my own practice. 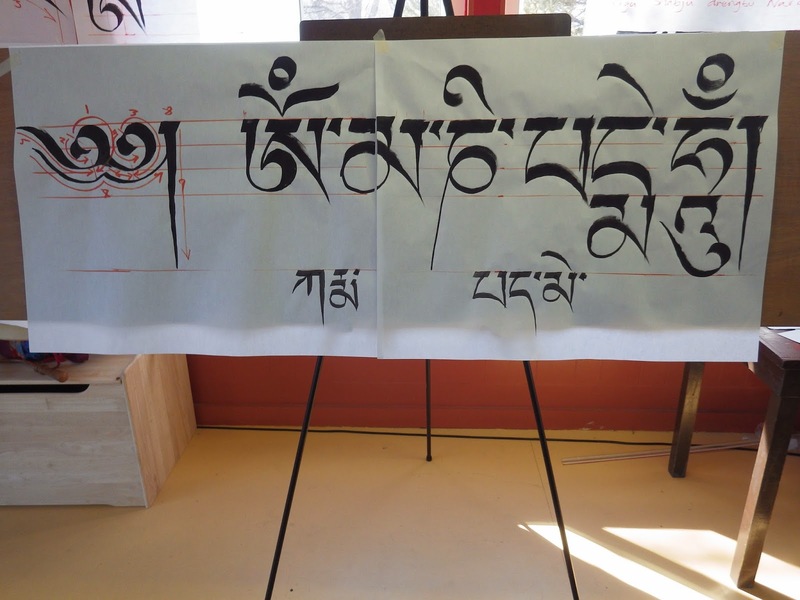 I hope to present other courses once I have refined and developed this approach more, not so much on the technical side of Tibetan calligraphy that I am already teaching, but for students who already have an ability in Tibetan calligraphy or calligraphy of any other tradition. My wish is to hold a course where we really focus on the meditation and how to approach it properly with a mind of now-ness. JG: Can you say more about that and what kinds of techniques would you use? TM: It is more the subject matter than the technique, You could practice this with something non conceptual, like the perfect circle of enzo, any person could can load a brush with ink…it is something that really interests me and is challenging to me as well and it is something that you can develop as a practice without having to learn a calligraphy tradition. JG: In the Jack Kerouac School we developed that with poetics as well. TM: This is interesting, I have to do some research, I know it in my heart, but it is how to communicate that and how to share it in a good way. TM: I have a very practical side to creativity as well and if I am saving time by buying a brush then I will do that. That comes from my mother, she is very practical. I will use anything that gives a nice effect. 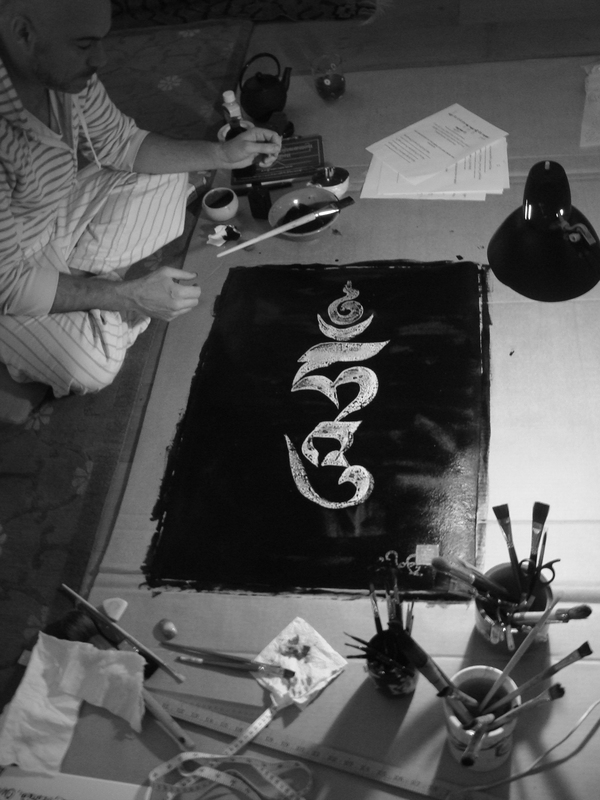 I don’t only use special calligraphy brushes, I mean I have them and use them, but I will use anything as my view is that the sacred is in everything. It doesn’t have to be an expensive Japanese brush. The sacred can be in anything, depending on how you use it with a sacred view, it can even be in an old raggedy worn out decorators paintbrush used for painting for your home. It is as much about the tool but your approach. That is the main point. If it gives a lovely raggedy effect that you were looking for, then all the better! No matter what brush you use. After all I don’t come from the Chinese or Japanese painting tradition; those brushes don’t actually suit the construction of Tibetan characters if you want them to look good. So the brush you referred to, the one I brought from New York, was a big fat flat brush, so it gave that big lovely chunky effect on that one piece I created on theme of confidence and faith. JG: You mentioned that Akong Rinpoche was your family Lama, so are other family members into the dharma? TM: Yes we all are. 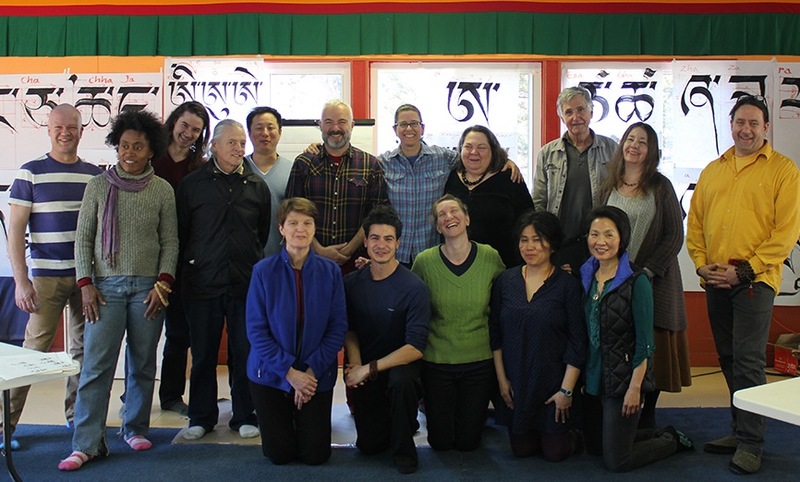 Akong Rinpoche used to say, “You are the first completely Buddhist family I know in the Europe.” Both my parents are practicing Buddhists as well as all my brothers and sisters and now their own siblings, three generation Buddhists. JG: So you had that culture, and all those years of training, and now you are integrating in the world. TM: Yes. 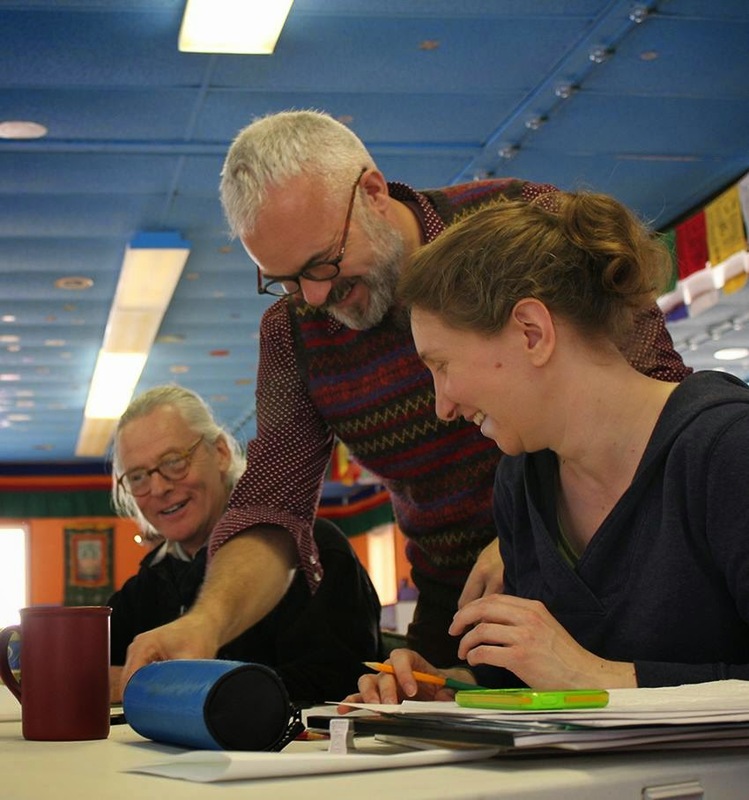 I think that is the way to go, you know immersing myself, being a monk, and learning in a completely traditional way is a really good way to absorb Dharma. But at some point, I am an Englishman after all, and a Westerner, and at some point you have to share that and my art is my medium to share that. JG: In terms of the Tibetan culture it is unlikely it will survive in its entirety, as the elder teachers die; I think there will always be elements of the Tibetan culture but it seems that the nature of mind teachings are beyond culture…How do we reconcile preserving Tibetan origins and culture within these traditions? Art is one way maybe? JG: Then the question is, is formal preservation enough, what about the essence of the actual practice? When they first came out of Tibet, there were magnificent golden monasteries, but what do we have now? Our minds. TM: This is a very important point, it is essential to practice to keep the Dharma alive and make it useful. There is dharma in Tibet and a lot of Tibetan–ism is with the dharma. As Westerners we are aware of this and sometimes there is a reluctance to take on the Tibetan-ism. So, in some ways, the Tibetan aspect of the Dharma needs to be weeded out to sit comfortably in the West. However the Tibetan culture itself has an awful lot to offer besides the Dharma. They were one of these ancient cultures that understand the relationship with the land and all the rest of it whereas in the West, we have become kind of detached from the land. JG: You said something like that before, you called Tibet an earth culture. Can you say something more about that? TM: As the American Indians would have had as well, it is being in harmony with the elements, with your land, and in modern society we are very separate from that. We live in centrally heated homes, and go about in air-conditioned cars, we are sort of out of touch with the land and the elements, we are almost too comfortable in a way. And its all fueled by oil and plastic bags from oil, you know everything is kind of false and of course it is all going to run out one day. We are finding alternative ways to manage that, we have spoiled our home, our planet, with pollution etc. As an old culture Tibet never did that, it did not contribute to that, so there is something to learn from the Tibetans in that respect too. I spent a month once in Tibet living and I spent a couple of weeks with Akong Rinpoche’s bother and his family who were nomads and we basically lived with them, they provided the food, and I, as a Westerner, started to get a little worried about the diet and looking at the food which was lumps of yak meat boiled up in water and nothing more than a pinch of salt and if you were lucky an odd bit of green leaf, floating around, pretty unwholesome looking – also there was tsampa, lots of tsampa mixed with tea and rancid butter – so to my Western conditioning this was a pretty unhealthy diet. Where were my five vegetables and fruits a day? and this sort of thing, and I thought I am just going to get really constipated and sick or something. But to my surprise the opposite happened. I got incredible strength from this and great vitality and I remember my cheeks went kind of rosy red like a little kids cheeks and I felt great. It made me realize the food there is totally “macrobiotic”, totally pure, organic, from the earth. It was a direct experience of how we should be as human beings in our relationship to the earth, our food and our environment. So that was quite interesting. I would like to go back and talk a little more about dharma coming to the West. It took someone like Trungpa Rinpoche to be able to translate what was Tibetan and what was dharma in a way that the Westerners could understand, especially in North America. It is a little different in Europe, especially in the North because we are Celtic and we have a slightly different understanding. I can see quite clearly why Trungpa presented the Dharma in the way he did it suited the [North] American mind. It would not have worked in quite the same way in the UK. I think the Celtic mentality is perhaps closer. There is an ancient condition that comes through – it’s true – so as far as a Westerner is concerned it is going to take a Westerner to completely absorb the Tibetan tradition from inside out, to practice and to realize it, become realized through it without ignoring their own culture, their Western culture; only that sort of person can make any changes, otherwise there is a danger of compromising and missing out what the essence of Tibetan Buddhism is. Something could be lost in translation, we could focus on what we kind of like and we can just adopt the culture without real understanding, there is a danger of compromising the teachings of Buddha to suit. However, I have faith in the way the Dharma is developing, there are Westerners quietly getting on with it, doing their retreats, under the guidance of the Tibetan lamas, and there is some realization happening. But it takes time. There is a lot of muddle in the translation and I don’t mean only the literal translation of the language, but also understanding and we can fixate on some aspects and miss out on other. It is going to take time and until that happens we are going to have to adopt and respect the Tibetan tradition. JG: Well it seems you have been practicing exactly that – how you were trained and then how you present to your students, very rigorous forms. TM: Yes, I bow down to the tradition, I don’t wish to compromise the tradition in the contemporary art I create, I don’t want to water anything down, if anything I want to promote the tradition in a contemporary way. I was trained that way and Akong Rinpoche instilled this into me all the time: to maintain a high standard and not to lose the essence.